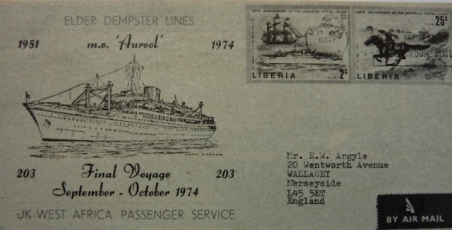 In March 1949 Elder Dempster ordered the third and final passenger ship to enable a fortnightly service from Liverpool to West Africa to be maintained. 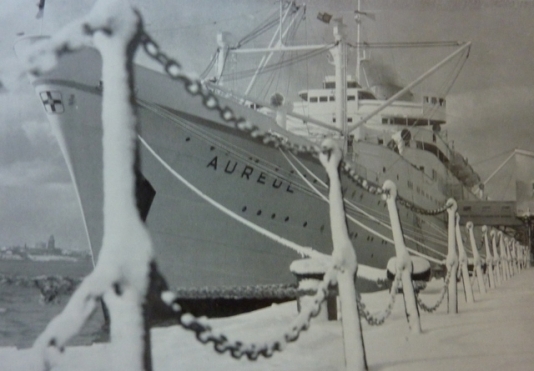 The new AUREOL (named after a mountain in Sierra Leone) was launched on 28th March 1951 by Mrs E. Tansley. Just over seven months later she left Liverpool on her maiden voyage, on 8th November, under the command of Captain J.J. Smith. The AUREOL in the Mersey off Liverpool. 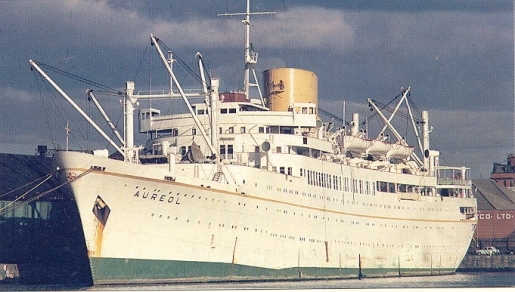 AUREOL Built by Alexander Stephen & Sons Ltd at Glasgow in 1951. The new ship was larger than her earlier sisters of 1947 - the ACCRA and the APAPA - and had cost twice as much to build as the earlier pair combined. The new AUREOL had accommodation for 253 first-class passengers, with another 100 in cabin class. A crew of 145 was required to man her. By the mid 1960s the West African passenger service was becoming less and less profitable. 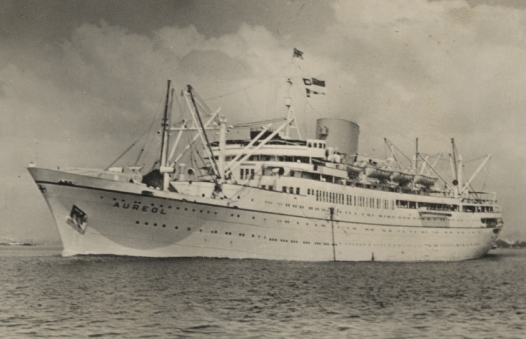 After the sale of the ACCRA and the APAPA in 1968, the AUREOL remained to carry on the service on her own and was converted to a one-class liner with 451 berths. Although the southbound voyage usually carried a near full complement of passengers, berth occupancy northbound had been little more than 60 per cent for several years. More significant than the decline in passenger numbers was the increase in operating costs in a ahip which necessarily carried a large crew. 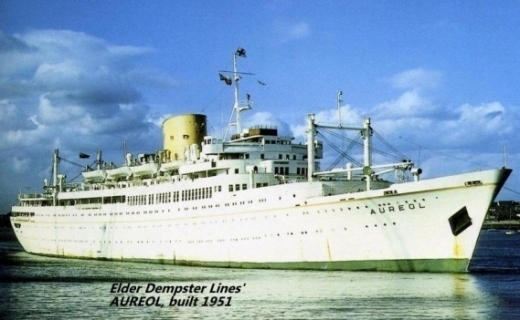 Speaking at a trade mission to Nigeria in November 1971, Mr Peter F. Erlam, a director of Elder Dempster, commented: "The AUREOL is now an old ship and is expensive to operate, maintain and repair." at Liverpool under a blanket of snow on 2nd February, 1969. 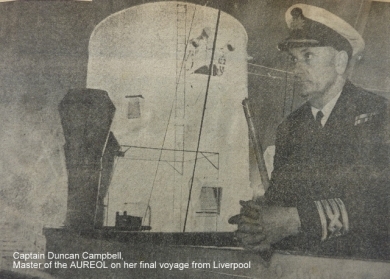 On 16th March 1972 the AUREOL made the final West African passenger sailing out of Liverpool. 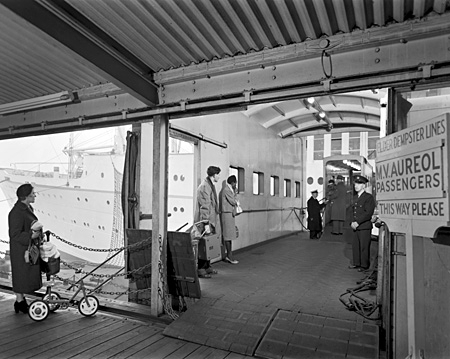 Her departure was held up by thick fog which prevented the liner leaving her berth in Brocklebank Dock for the landing stage. The chief barkeeper on the AUREOL, Malcolm Hanlon, summed up the feelings of regret when he said: "Liverpool is such a great port. To see a ship like this leaving for the last time really does hurt." The Mersey Docks & Harbour Company commented: "We are pleased to note that the AUREOL will be replaced by an express cargo service to West Africa from Liverpool." Not much sentiment there ! The AUREOL returned to Southampton at the end of this voyage as the Mersey Docks & Harbour Company had closed the passenger facilities at Princes Landing Stage. Southampton remained the U.K. terminal for the next two and a half years until 21st October 1974 when the ship was laid up in the southern port after completing 203 round voyges in the West African passenger trade. Mr G.J. Ellerton, the chairman of Elder Dempster Lines, said that the withdrawal of the AUREOL was a matter of deep regret. It would mean the end of a service begun in the 1860s, and for that reason they had hoped it would be possible to find a replacement ship which would enable a viable passenger service to be maintained. The AUREOL was quickly sold to the Marianna Shipping & Trading Company of Panama, and in January 1975 she was renamed MARIANNA VI. In March she arrived at Jeddah to be used as an accommodation hostel. Four years later, in 1979, the former AUREOL was towed to Piraeus to be overhauled and refurbished. The following year the MARIANNA VI was back in the Red Sea at Rabegh, some 125 miles north of Jeddah, once again in use as an accommodation ship. 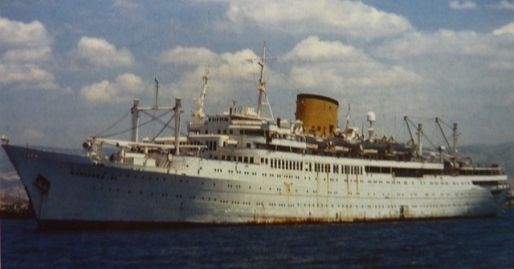 Ten years later, in 1990, she returned to Piraeus where Elder Dempster's last passenger ship was laid up in good condition. before she was towed to Alang for demolition. A very beautiful ship, right up to the end. the AUREOL arguably had the most graceful lines. I am bound to California, a place I know right well. But my darling when I think of thee." 'Today the graceful liner AUREOL, the flagship of the Elder Dempster fleet, and the last of the great liners to ply from Prince's Landing Stage, says a 'farewell' to the Mersey and writes 'finis' to a proud era in Liverpool's maritime history. 'Liverpool Echo' readers will have watched with sadness over the past decade as our columns have chronicled the passing of some of the most illustrious names in Lloyd's Register of Ships. And, on each occasion we have said 'goodbye', we have wondered what there could be left to write about. 'Yet, as the last echoes of the sirens fade, the ghosts of other great ships will slip by in the wake of the AUREOL as she passes into the hazy distance beyond Perch Rock. 'Ships like the BRITANNIC, the GEORGIC, the MAURETANIA, the SCYTHIA, the CIRCASSIA, the REINA DEL MAR, the NOVA SCOTIA, the VOLTAIRE and the HILARY, and the utterly magnificent EMPRESS OF SCOTLAND. 'It was in Liverpool that the age of luxury afloat came into being with the introduction of steamships on the North Atlantic. 'We can truly claim to have seen it all. 'Elder Dempster cannot be blamed for taking their great white ship to Southampton. Circumstamces have dictated the decision for them. 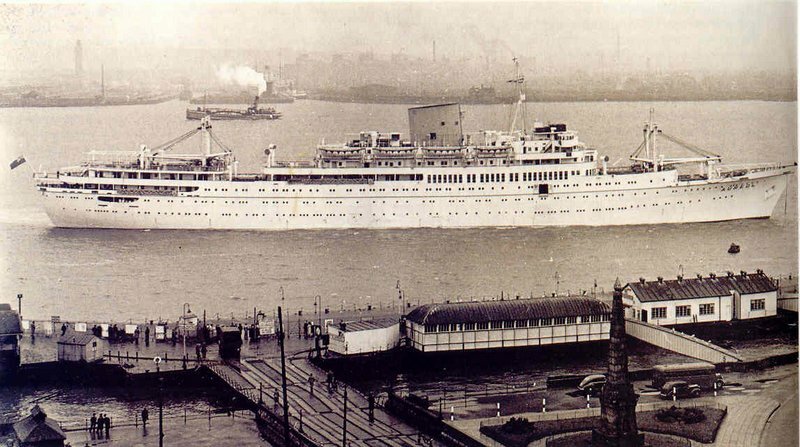 It would hardly have been an economic propostion for the Mersey Docks & Harbour Board to have provided a landing stage for a passenger sailing just once every six weeks. 'The Port of Liverpool has today said 'goodbye' to some of the glamour that made it unique amongst world ports'. The AUREOL alongside her berth in Liverpool Docks.